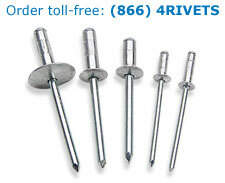 Multigrip rivets have a wider grip range than standard blind rivets and also offer several other advantages. The "bulbing" action of a multigrip rivet ensures complete hole fill even in oversized, irregular or misaligned holes, provides high clamp-up and high shear strength and ensures positive stem (mandrel) retention, plugging the end of the rivet body and providing a vibration and weather-proof seal. Our multigrip rivets are available in industry-standard dimensions and are interchangeable with multigrip rivets from other leading suppliers. Our multigrip rivets meet IFI Specification 134. All dimensions nominal unless otherwise stated.